Wash, cut, brush and dry. You can keep your dog well-groomed! If you have seen your dog rub or roll on the rug, or chew and lick at her fur, you have witnessed her attempt at self-grooming. Have you ever tried to give yourself a haircut? Then you know we can all use a little help sometimes, even Fido. Only groom your dog when she is calm, perhaps after a walk or a play period. 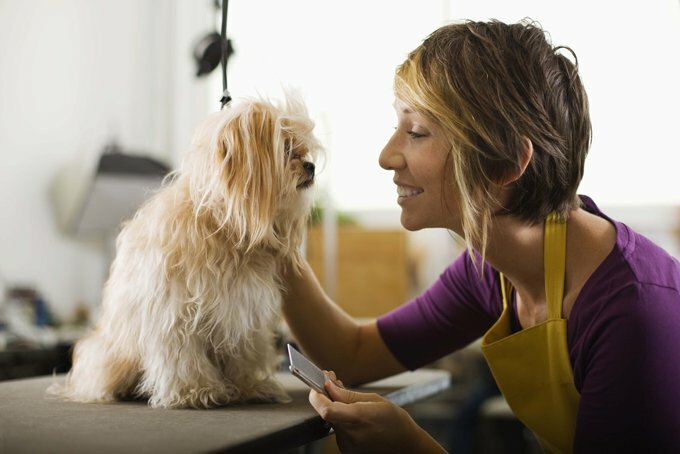 Keep your first grooming session short (maybe 5 to 10 minutes) until your dog becomes used to being handled this way. Slowly add more time to the sessions until there is enough time for you to do a proper grooming. You can get a head start on making her at ease by petting all over her body, including touchy areas like tails, paws, stomach and ears. Praise your pup all throughout the grooming and be sure to offer a tasty treat when you are through. She’ll soon come to think of it as a pleasant experience. Dogs naturally gather dirt, grass, weeds, and other irritants in their fur. Brushing or combing regularly will help keep your dog’s coat and skin clean and healthy. Different coats require different tools and procedures. First, loosen dead skin and dirt by using a soft bristle brush (like those made for puppies) made of rubber or plastic. Next, use a stiffer bristle brush to take out dead hair. Lastly, rub a chamois cloth over her body to give it a nice sheen, and your easy-grooming dog is ready to go. Use a slicker-style brush to remove tangles. Pick up dead hair with a bristle brush. Don’t forget to pull a comb though her tail. Daily use a slicker brush to smooth out tangles and remove matting. Next, brush the coat with a bristle-style brush. For dogs with very long hair, like an Afghan Hound, include the area around her feet known as the hock. You may also need to trim this area regularly. Veterinarians and other pet specialists recommend that you bathe your dog at least every three months. Your dogs may require more frequent baths, especially if she spends more time in the yard or outside. Shampoos should be mild and approved for use on dogs to avoid skin irritation. Before bathing, brush your dog to remove any dead hair or mats. A bath mat made of rubber should be placed in the tub to keep your pooch from slipping and sliding. Use lukewarm water, filling the tub to a maximum of four inches. If the tub is equipped with a hand-held shower head, use it to dampen your dog from head to tail. Be careful not to aim the nozzle directly into her ears, nose or eyes. If you don’t have a hand-held shower head, a large pitcher or plastic container will do fine. Lather in the shampoo all over the coat. Thoroughly rinse the shampoo again steering clear of the ears, eyes and nose. This is a good time to check your dog’s ears for odors or dirt. Use a vet-approved solution on a cotton ball to clean the ears. DO NOT insert the cotton into the canal. Use a large towel and, if needed, a hair dryer set on low heat to dry your dog. Many dogs will want to run outside and rub all over the grass or dirt right after a bath. Confining her to the house for a little while will prevent having to repeat the whole process immediately. Many dogs squirm and wriggle during a bath, especially young puppies. Puppies may also nip at you as you try to bathe and brush them. Toys and treats can help redirect their focus during grooming. As we mentioned earlier, handling your dog from tip to toe to tail from the time they are very young will help you accomplish this sometimes unsettling task. Through gentle massaging and reassurance, you can get your dog used to you touching them in some of the most sensitive areas, including their nails. By doing this for at least two weeks before attempting to trim your dog’s nails, they will probably be open to it. Examine each of the paws for grime and weeds, especially burs and foxtails, cleaning as needed. Using sharp, guillotine-style dog nail trimmers, snip the tip of each nail at a slight angle, just prior to where the nail curves. Stay away from the quick, a vein that runs into the nail. On many dogs you can see the quick as a pink area within the nail. In some dogs, the nail may be too black to see the quick so trim carefully. A smaller cut may be in order in this case. If you do unintentionally trim into the quick, bleeding may result. Keep a styptic powder or cream on hand to stem the bleeding. Use an emery board or file to smooth any jagged ends on cut nails. Breeds such as Pugs and Shar-Peis have loose skin and wrinkles. These dogs will require more attention during the grooming process. First, to prevent grime and even bacteria from becoming a problem, clean in the folds of their skin with damp cotton and then dry well. Keeping these areas dry is also important after a bath or a walk in the rain. Long droopy ears such as those on a Basset Hound or Cocker Spaniel must be checked weekly for buildups of wax and dirt. A cotton wad with a little water or mineral oil can help keep the ears clean and dry. Drops specifically designed to clean and dry the canal should also be applied for these ear-infection prone dogs. Hair that grows around the canal entrance should be kept trimmed. You can check with a professional groomer or veterinarian for instructions on how to properly and safely do this. Special tools may be available for this unique task.